Miguel Castro, left, and Dr. N. Alan Clark. Two Middle Georgia State University music faculty members will perform their recently published concert band composition, Industria, with Warner Robins High School at the Alabama High School Honor Band Festival in February 2018. Also, the Arbor Creek Middle School Band from Carrollton, Texas, will perform Dr. N. Alan Clark and Miguel Castro's composition at the prestigious Midwest International Band and Orchestra Clinic this December in Chicago. The Midwest clinic is the largest and most respected band and orchestra clinic in the world. Clark is Middle Georgia State's director of Bands. Castro is the University's percussion coordinator. Both are playing key roles in expanding the music program at Middle Georgia State. "The Alabama festival will provide us with a regional music presence and the Midwest clinic in Chicago will give us international exposure," Clark said. 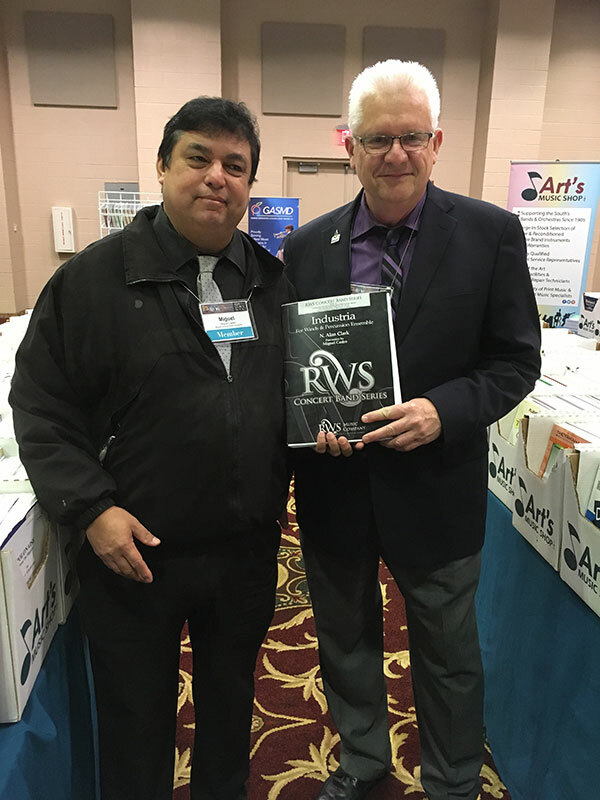 Clark and Castro also learned recently that another of their compositions, Palustris, has been accepted for publication by RWS Music in its 2018 band music catalog. Industria is also published by RWS Music, a publishing company with a worldwide distribution that is owned by renowned composer Robert W. Smith. For more information, contact Clark at norman.clark@mga.edu.